Holsworthy Community College held its annual Year 6 into 7 Summer School from Monday 22nd August to Friday 26th August 2016. This year we had 18 pupils who attended Literacy and Numeracy in the mornings, then a variety of outdoor pursuit activities in the afternoon with Outdoor Adventure based in Widemouth Bay. The exciting afternoon activities were team building, body boarding, kayaking, rock climbing and canoeing. These activities stretched the pupils both physically and emotionally and, with encouragement, they rose to the challenge. 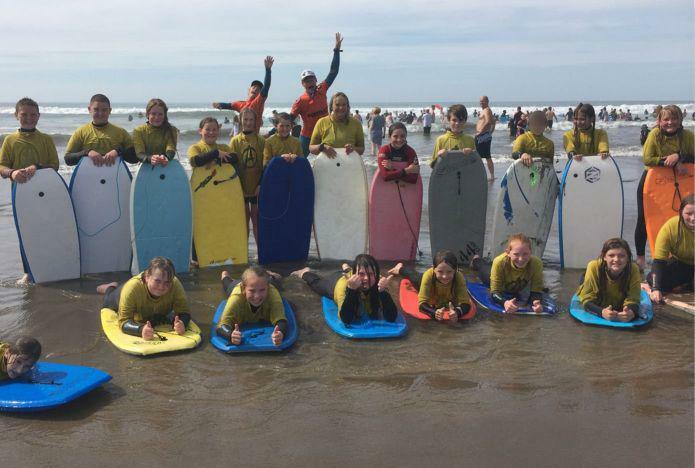 The Outdoor Adventure Instructors were so impressed with our pupils that they extended the bodyboard sessions by ½ hour free of charge! Thanks to Mr Lovett for his inspirational Literacy sessions in the local community, Mrs Curry for her fun Maths Olympics and Mrs Jenkins for her fabulous organisation and TA work. Also Colleen Wilcox, Year 9, who volunteered to help as a TA for the week. The focus of the Literacy Summer School has been to connect language to experience. Students visited the local museum where the exhibits connected students directly to Holsworthy’s past. Students were asked to write about an artefact that they found particularly intriguing; perhaps they had some personal connection to it, or that they found it special in some way. The literacy work also included a walk in the local forest where students watched, listened and smelt the world around. By focusing on the senses students have worked to invigorate their imaginations and stimulate ideas for writing about the places in which they live. Students listened to poems about using your imagination to see what others might not see, they heard a story about a hill that ate people, and also considered the emotional depth in Roald Dahl’s ‘Danny the Champion of the World’. As their final project students have written poems, stories and pieces of non-fiction about their homes and the places they live. They have been able to personalise their writing by taking ownership of the language they have chosen to use, and directly relating it to their own experiences.